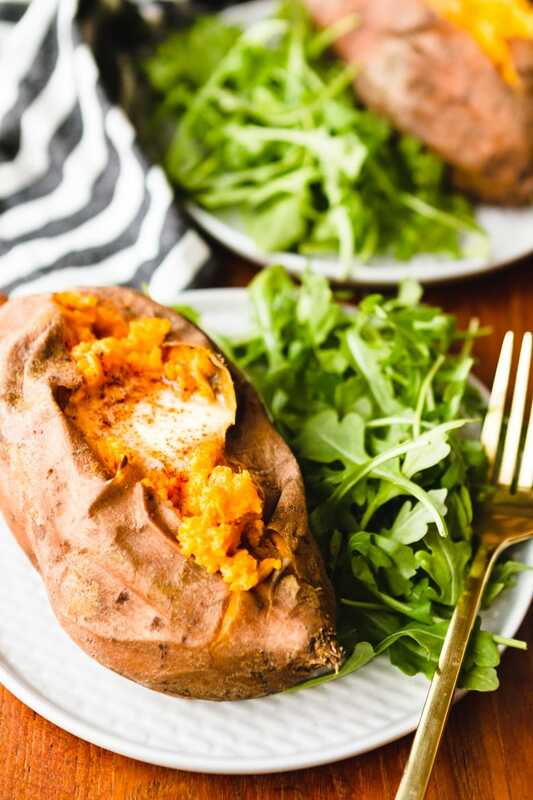 No more undercooked sweet potatoes, this one simple secret will produce a perfectly cooked Instant Pot sweet potato every time… Making sweet potatoes in the Instant Pot is a total game changer for meal prep or those doing a Whole30! 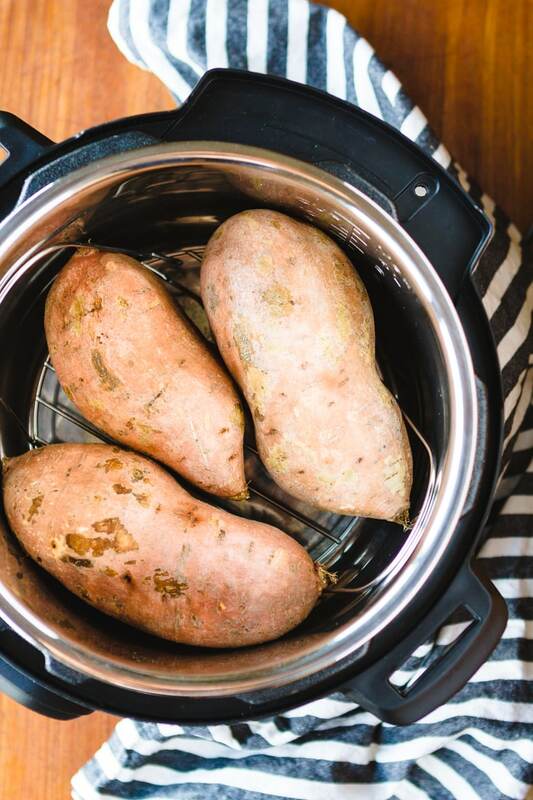 First off, I owe you all an apology… I’ve been promising to share how I make sweet potatoes in my Instant Pot since LAST JUNE — and I totally dropped the ball. But since my balsamic grilled chicken is going bonkers with you Whole30-ers right now, I’ve received several emails asking about the recipe. So… thanks for calling me on it, and I’m sorry! Better late than never, right? Here’s the thing, though — there’s kind of a reason behind why I haven’t shared it yet: I couldn’t get the timing right. Which was super frustrating! As with cooking times and ovens, there’s also a bit of leeway in cooking times between all Instant Pots. So when I make a new recipe, I know it’s a given that I might need to play with the timing and adjust it a bit from the recipe as written. But after trying several sweet potato recipes/methods, I had a hunch that it was more than just a timing issue. Even with using the same method and timing across several different batches, the texture varied from extra tender to still having a bit of chew. They were never inedible, but I wanted a bit more consistency in the outcome before sharing. And then one day it hit me — all of the recipes for Instant Pot sweet potatoes I tried called for a medium sweet potato. Exactly what does a medium sweet potato look like? I typically buy the ginormous bags of sweet potatoes from Costco, which contain quite an array of sizes. Some could qualify as two servings, while others barely one. I just knew this was the root of all of my consistency issues, but I didn’t know how to control it. So I turned to Google, of course… And buried in an obscure post on the Instant Pot website, I found the simplest of solutions. Are you ready for this? 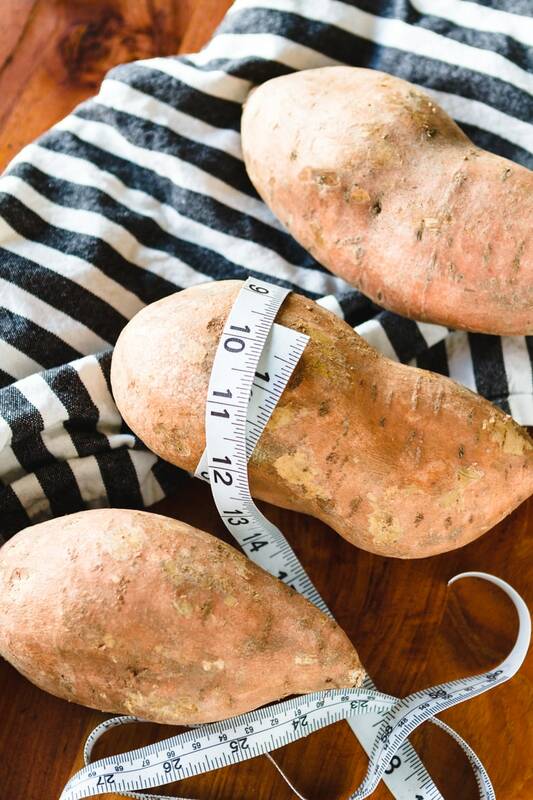 For perfect sweet potatoes in the Instant Pot, all you need to do is pick up an inexpensive sewing tape measure to measure the circumference of your sweet potatoes! Voila, a perfect sweet potato every time… Crazy, isn’t it?! Once you’ve measured your sweet potatoes, you can group like sizes together and adjust your cooking time based on their size and your preference in texture. I’ve put together a little chart below that should help you calculate your cooking time. TIP: Toss one of these vegetable brushes in your cart, too. The amount of extra dirt they scrub off potatoes versus hand washing alone is shocking! There’s really nothing to making perfect pressure cooker sweet potatoes once you have the cooking time ironed out! Scrub between two and four sweet potatoes of roughly the same size well under cold water, measure their circumference to calculate the cooking time, and then set them on the steamer insert inside the stainless steel insert pot. Press the Manual button (Pressure Cook if you have the newest IP-DUO60), make sure your pressure is set to High, and set your cook time according to your earlier calculations. Once the sweet potatoes are done cooking, allow the Instant Pot to release its pressure naturally, which should take roughly 10-11 minutes. Open the lid carefully, and enjoy! 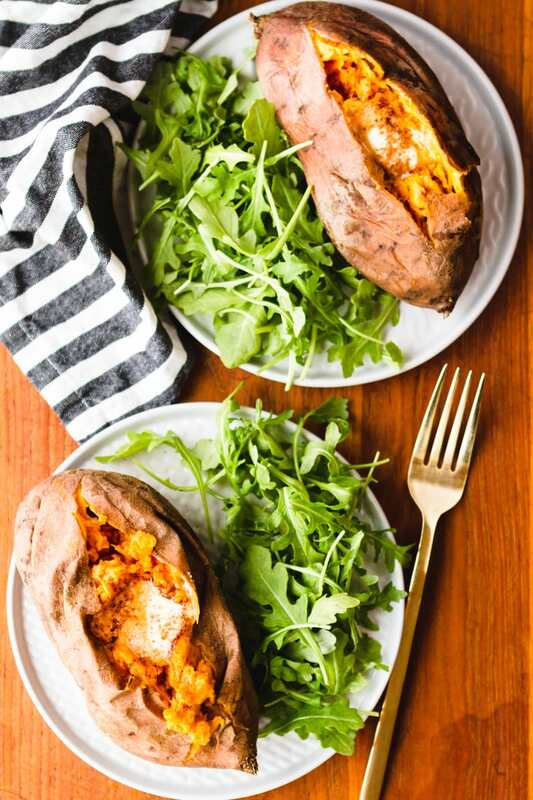 Pressure cooker sweet potatoes last for up to 7 days in the fridge, making this method an ideal part of your meal prep routine. I happen to love them cold, but sometimes I also slice them up and fry them in avocado oil, then top them with guacamole. That’s one Whole30 breakfast I always look forward to! With a stiff veggie brush, scrub and rinse the sweet potatoes well under cold water. Using a sewing tape measure, measure the circumference of the sweet potatoes in inches, and calculate your cook time according to the notes below. Place the stainless steel insert pot into the Instant Pot base, along with the included steamer insert. Pour in 1 cup of cold water, and place the sweet potatoes on the steamer insert. Lock the lid on top of the Instant Pot, and make sure the steam release knob is turned to “sealing”. Use the plus or minus buttons to set the cook time according to your calculations based on the chart in the post. Wait a few seconds and you should hear a beep. At this point, the display will read “on”, indicating that the Instant Pot is pressuring up. Once it comes to pressure (about 9-10 minutes), it will switch to the timer to steam the sweet potatoes. Once the sweet potatoes are done cooking, allow the pressure to release naturally for 10 minutes. Then use a thick towel or a pair of tongs to turn the steam release knob to “venting”. Open the lid carefully, and enjoy! 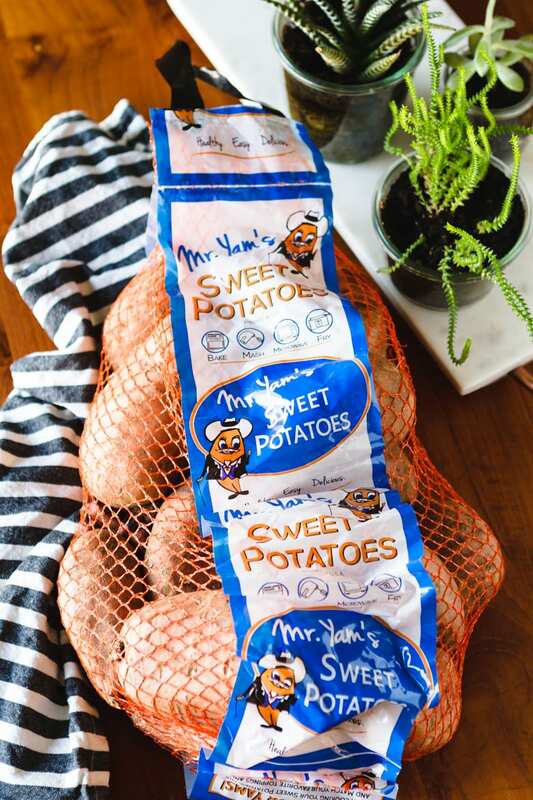 Cook time: The cook time is based on your sweet potatoes’ circumference and your texture preference, lower end for cooked with some chew, higher end for fully tender sweet potatoes: 6 inches – 15 to 20 minutes; 8 inches – 25 to 30 minutes; 10 inches – 35 to 40 minutes; 12 inches – 45 to 50 minutes. See the chart in the post for complete details. Storage: Pressure cooked sweet potatoes will keep for up to 7 days stored in an airtight container in the refrigerator. 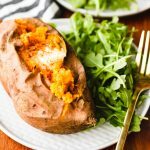 If you love this sweet potatoes recipe, I think you’ll also adore this method for 6-minute Instant Pot hard-boiled eggs! 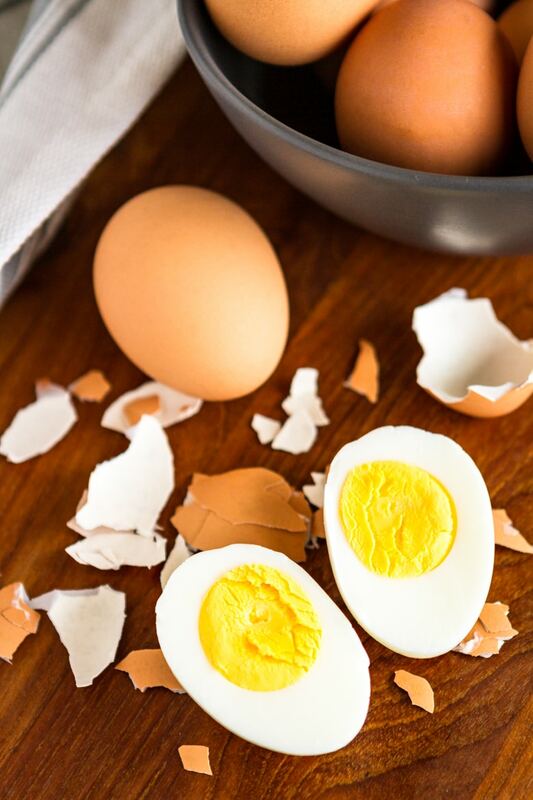 They turn out amazing every time: easy to peel, perfectly cooked and never have those icky green yolks… I make a batch of both of these during my meal prep session each week! I’d love to see how your sweet potatoes turn out… Tag me @Unsophisticook on Instagram or use the hashtag #Unsophisticook so I can check it out. Enjoy! Dang, that is genius! Don’t you love the Internet, it’s like things you maybe wouldn’t have thought of but are so simple and perfect! Excited to try this in the IP! Thanks, Tara! Thank you for the great instructions for cooking sweet potatoes!!! I had a huge potato and I had not used the instant pot for that yet. Using your suggestions, I cooked the best sweet potato that I ever ate!!! So happy to hear that, Bev! I’ve tried twice now but both times my eggs got a green ring and the whites seemed rubbery. I strictly followed the timing and process. I did 18 eggs. Any suggestions? I’m assuming you’re referring to my Instant Pot Hard Boiled Eggs recipe? There can be slight variations between Instant Pots, so it sounds like you just need to play with the timing a bit. There are even slight differences between my 6-qt. and 8-qt. models. Try decreasing the cook time to 5 minutes on your next batch, and if that’s still not enough, you can even try 4 minutes. Hope you get it worked out just right for your IP! These just look delicious and so easy to make! I really need to get that instant pot. I hope they go on sale soon. Actually, in my area, they’re not even in the stores. Everyone is sold out.